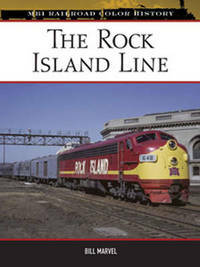 An icon of railroad history, the Chicago, Rock island and Pacific Line endured for nearly 130 years, becoming a legend celebrated in song and railroad lore. This book traces the history of the Rock island Line through triumph and tragedy, from its brilliant beginning 1850 to its death in the winter of 1980. Illustrated throughout with period colour and black and white photographs, examining infrastructure, freight services, and a locomotive fleet renowned for its diversity - including the famous Rocket trains: Rocky Mountain Rocket, Choctaw Rocket, Twin Star Rockets, and the diesel Rocket streamliners - this also includes details of a fascinating history (Abraham Lincoln represented the line in a lawsuit) as well as an examination of the complex merger that led to the demise of this solid, dependable railway. Bill Marvel, who grew up a few miles from the Rock Island's western terminus in Denver, rode and photographed all over the Rock Island system before its 1980 demise. A lifelong newspaper writer, he is the author of four railroad books, numerous magazine articles and is working on a book-length narrative of the 1913 -1914 Colorado coal war. He lives in Dallas, Texas.